Simuwu offers a range of furnaces up to 3000°C which are perfectly suitable for the various requirements of graphitisation. Heat treatment up to 3000°C under inert atmosphere induces the structural change from highly disordered or defective carbon atom structures into a perfectly three-dimensional crystal of pure graphite, an important material for a multitude of applications. 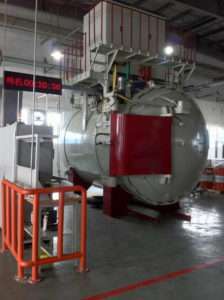 For starting material which consists solely of carbon atoms and is very clean with minor impurities, a graphite furnace of the range or the range up to 3000°C is suitable. Both, heating elements and insulation of the cold wall furnaces consist of high quality graphite materials. The top loader furnace is fitted with a circular mantle heater in a perfectly symmetrical meander. In the front loader chamber furnace the sample is heated symmetrically from four sides. If organic matter of unknown composition, or containing a large amount of impurities is used for graphitisation, it is recommended to purify the sample by pre-carbonisation under inert gas atmosphere before heat treatment in a more sensitive high temperature graphite furnace . This can be done in a low temperature hot wall furnace of the range up to 1100°C. For samples consisting of carbon atoms with only little impurities Simuwu offers specialised graphite furnaces with dedicated debinding equipment, where carbonisation and graphitisation are carried out in one heat treatment step. Those furnaces are equipped with a retort and an intelligent gas guidance system which assures that the impurities are safely discharged from the furnace into the afterburner.